Where would you like galleries stored? – You can change this folder if you’d like to change the default location where NextGEN creates folders and stores image files. Please note that if you already have NextGEN Galleries and you change this setting, your old folder and files will not be moved. Your old galleries should continue to work from their previous locations, but you should confirm after any changes. The best time to change this setting is when you are first starting to use NextGEN Gallery. Delete Image Files? – With this setting selected, all images will be permanently deleted when you delete the gallery. You can delete a full gallery under Gallery >> Manage Galleries tab in your WordPress dashboard. What should images be resized to? 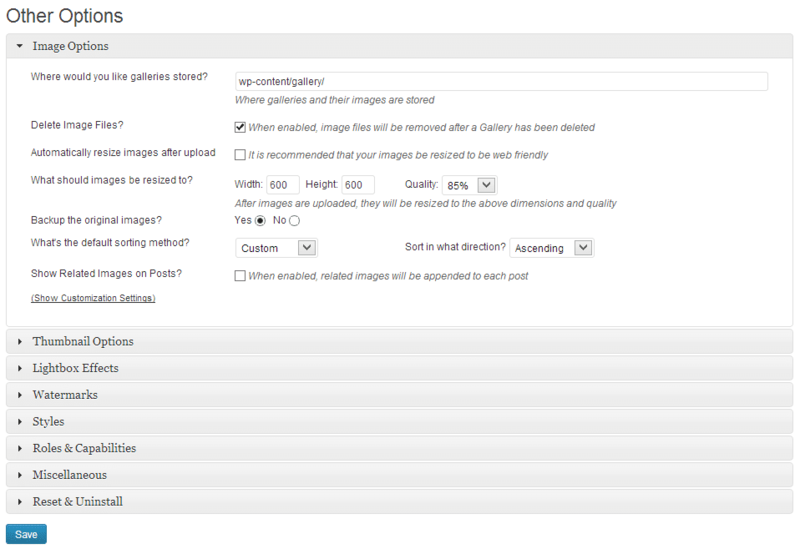 – With the above setting selected, images will be resized automatically after upload to be web-friendly. This setting is recommended if you’re uploading your images at full resolution. Full resolution images will slow down the load time of your galleries without being resized. Backup the original images? – We always recommend this be set to yes. If yes, a back up of the original image will always be available in case you need to restore it. For example, if you later resize an image, apply a water mark, rotate or flip an image, etc, and decide you do not like the change, you can select the same image and click “Recover from Backup” and the original image will be restored. Default Sorting Method - If you set this to “Custom” you will be able to customize the sort order as needed on a gallery by gallery basis. If you select any other default sort order NextGEN Gallery will automatically sort images based on those settings, and you will not be able to customize them for individual galleries. Show related images on Posts? – When this option is selected, related images will appear at the end of each blog post.